Gone are the days when bridal outfits had to be super heavy. I remember brides drowning in heavy bridal attire. It takes a massive amount of strength to keep a smile throughout the wedding festivities while dying a slow death on the inside. Enter Feather Light Wedding Outfits. 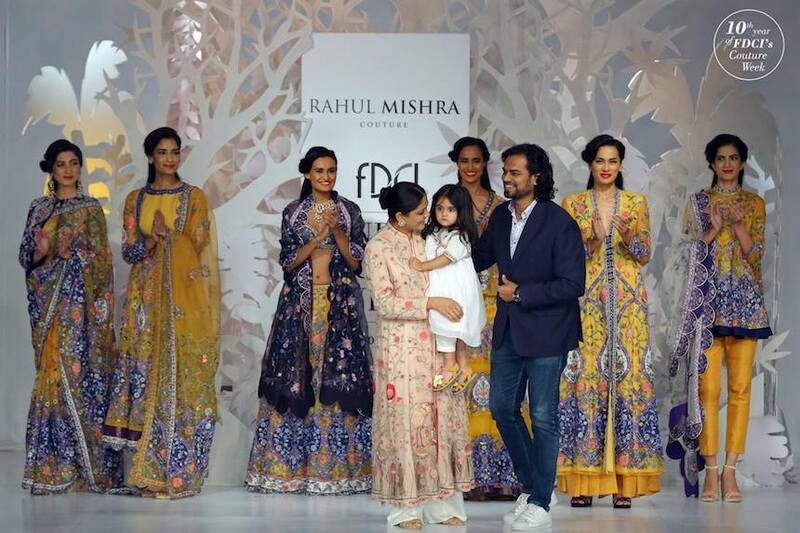 Rahul Mishra’s latest couture collection at FDCI ICW 2017 showcased some stunning light on the eyes, light to wear wedding outfits. There was colour, drama, texture and designs that got me thinking..the collection has pretty much covered the bride, her sisters and the mother of the bride as well. Pretty brilliant to achieve that all in one collection. Here are some of my favourites. Light colours for lehengas are trending for awhile now, but what makes this collection stand out is the fact that these are Feather Light Wedding Outfits. It means you can dance, have fun and preserve your energy throughout your wedding. The collection is called ‘Parizaad’, which means born of the divine. It takes inspiration from century old Persian, Roman and Byzantine architecture, and the intricate use of geometric patterns, tiles of flowers and mosaic of nature, emphasising great design aesthetics from a time when human skills were divine. If you as the bride/grooms sister are going for the more sophisticated elegant style, then Rahul Mishra’s Parizaad collection is perfect for you. The look of the outfits is modern, yet traditional in style. Capes look so good, and using it with a saree is just brilliant. Why should moms be left behind? If you want a stylish mom look at your daughter/sons wedding, this is definitely a good style to go for. She has brought a lot of good luck and mental prosperity. We don’t take her to work much. Today was her first time at backstage and show. We are taking her to Paris also. My show is on September 30. It’s her birthday also.